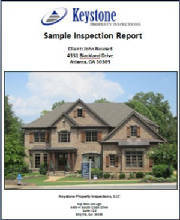 Over Other Atlanta Home Inspectors? This Wall & Floor Appear Dry. Moisture Not Visible To The Naked Eye. Missed problems not found during your Atlanta home inspection can cost you hundreds, if not thousands of dollars. These problems will eventually begin to show up after you have purchased and moved into your home. You will be stuck with unexpected and expensive repairs, that you were not prepared to make. Remember.....Home Inspectors in Atlanta Can't Report What They Cannot See. During every Atlanta home inspection, we perform a complete, detailed and thorough inspection of your home, which includes an Infrared Thermal Imaging (ITI) Scan of the entire home, this technology is now available for residential atlanta home inspections and shows areas of missing and displaced insulation behind the walls and ceilings, moisture from roof and plumbing leaks inside the walls and ceilings of your home that are not accessible or visible during a standard traditional home inspection. Protect yourself and your largest investment by choosing us to evaluate and inspect your entire home. Every inspection is performed by Kip McCullough, the owner of Keystone Property Inspections. 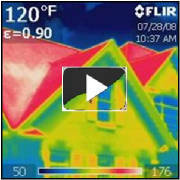 Kip has performed thousands of home inspections utilizing Thermal Imaging Technology. His extensive background in construction management and as a ASHI and InterNACHI certified home inspector gives him the incite to go above and beyond his client's expectations. "Keystone Found Leaks That Our Contractors Could Not"
"We continued to have water leaks in our Welcome Center here at the Church. Keystone found them while providing excellent service. Kip,explained the process, answered all our questins, and has solved the problems. I wish all our vendors were as great as Keystone." "Keystone Property Inspections is the best investment you can make for your new home. The house we were purchasing had already been inspected by another company and we were given a copy of the report. We could have just used that report and saved the cost of the inspection. We decided to hire Kip anyway. We were so glad that we did. He found several serious issues that the other inspector completely missed - like gas leaks and mold. 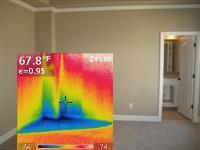 His infrared thermal imaging pointed out areas missing insulation and sockets that were running hot. His report was very easy to understand. We've bought and sold several homes through the years and Kip's inspection was simply the best." "There are some exceptional inspectors, and then there's Kip & Keystone. Very knowledgeable and patient, he answered every question no matter how minor the subject, and found every flaw that we knew of, and then some. What really set his inspection apart was the FLIR thermal imaging camera. Kip found missing insulation in walls and leaks in the floor for which there were no signs visible to the naked eye. This is how all good inspections will be done in the future and Kip is already there." "Keystone Property Inspections provided us with an extremely comprehensive inspection of the home we are buying. Kip, who inspected the house, went over all aspects of the inspection, made sure we understood the terms he was using, gave some guidance on repair priorities, and even suggested repairs we could do ourselves. Kip is as much a teacher as an inspector. The inspection report is very detailed and easy to follow. The report will serve as an excellent guide for making the home better in the short-term and the long-term. In short, Keystone's inspection was an excellent investment. We very highly recommend them." "Most Thorough Home Inspection Ever!" "We're new to the Atlanta area & chose Kip @ Keystone for our inspector because of his website touting the infra-red camera he uses to check for heat differential. He was prompt, professional, friendly, knowledgeable, & ready to answer questions at any time. The infra-red camera was able to see behind the wall to pick up several areas that were missing insulation as well as moisture that had yet to show on the outside of the sheetrock. The thorough online report was so cool & so well documented I was able to email this report to a contractor to get a bid for repair. Everyone who saw this inspection report was really wowed. I would highly recommend Kip @ Keystone to anyone." "It was a pleasure working with Kip on our recent home inspection. Not knowing what to expect, he did an extremely thorough job inspecting the home and explained things as he went along, putting us at ease. When I told others the amount of time he spent with us, their first words were 'WOW, he must be really thorough!" I am pleased beyond words because I feel like there won't be any "hidden" defects in the home we plan to buy. Thanks Kip and we will recommend you and Keystone to everyone!" "Kip is a pleasure to work with. His inspection was lengthy and thorough, and his explanations were very clear. The inspection report is well documented with pictures and descriptions of the issues he found. Kip has an excellent grasp of the kinds of problems that may exist in an older home, and he not only explained repairs that should be made now, but he gave me a list of things to monitor in the future and other fixes that would be advisable when I can afford them. His thermal imaging camera also makes him able to find problems that other inspectors might miss. I recommend Kip without reservation to anyone looking for a great home inspector." "The most impressive part of the inspection process was Kip’s availability after the inspection. I made countless calls after the inspection report was completed to discuss items with Kip. Not once was I rushed off the phone or made to feel like I was overbearing with my inquiries. Kip provides something that is very rare these days … customer service after the sale. I recommend Keystone to anyone in need of an inspection." "Kip and Keystone Property Inspections went WAY beyond what I was expecting to get when I had my first house inspected. I can't even start to explain how thorough Kip's inspection process and reports are. He was able to identify issues that were almost imperceptible. He also let me know which issues were the most important (which to have the seller fix) and other problems that were more mundane and were projects that I could take care of over a weekend. Kip answered any and all questions that I had (which were numerous) and couldn't have been any more helpful. I was very impressed with the emailed inspection report which had a written description of every issue, as well as a picture detailing the written description. That made it very, very easy to understand and remember any problems. Also, besides being a neat gadget, the infrared camera can find anything that the house (or seller) might be trying to hide. There is no escaping Kip's camera!" "Best Inspector In The Business"
"Kip is the most through, most knowledgeable, and best equipped home inspector I've ever worked with. We've worked with many inspectors throughout the U.S. as we've moved, and no one has ever spent as much time inspecting every inch of a house. He also answered every question we had before, during, and after the inspection. The thermal imagining was also invaluable at uncovering hidden problems (Not mention one of coolest IR cameras I've seen). Kip is the best value you will find for your dollar anywhere!!!!!" "Kip at Keystone Property Inspections commitment to professionalism was tested on my inspection. He took the time to answer all of my questions, educate me on every aspect of his (and my) concerns and offered advice that I will take forward with me on our next purchase as well as future purchases. The infrared scan is by far an advantage over any other inspection company out in the market as it revealed issues that other inspectors would never have found. All in all, the service was more than I expected and I will recommend Keystone Property Inspections to anyone wanting this service." "Perfect Inspector For 1st Time Home Buyers"
"Kip was truly a professional. During his inspection, he explained everything he was testing and why without slowing down or looking annoyed. He took his time and made sure everything was done correctly even if it ment looking at it again. I would recommend him to anyone." "Kip Is Superman Inspector--He Can See Through Walls!" "Kip has all the bells and whistles to "see" behind the walls, check every outlet, nook and crevice. His thermal imaging technology and thoroughness matched with his dedication and expertise--we KNOW we're buying a great house. He took over 4 hours to do the inspection. He took pictures and meticulously explained why the builder did what, what needed to change and how to do it, and how to improve our home value in the future. He gave kudos to our Traton Home Builder for going the extra mile on a lot of details. 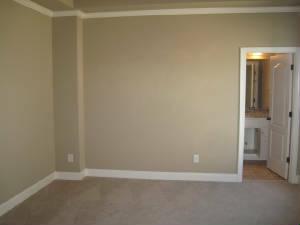 Kip is pleasant, professional, thorough, knowledgeable and has the ability to see though walls! He's Super Inspector!" Let Kip McCullough with Keystone Property Inspections Help Prevent You From Buying The Money Pit!